Hillary Clinton remains the Democratic frontrunner in every poll across the board. However, a freshman senator from Massachusetts, Elizabeth Warren (D-MA), is making significant waves in the political landscape, especially among liberals and progressives. Imagine if these two ladies were to ultimately join forces and create a unified platform, such as overturning the recent U.S. Supreme Court Hobby Lobby decision, what potential reforms could be achieved. Could a Clinton and Elizabeth Warren dual ticket be the answer to the Democratic Party’s prayers and prove unstoppable for the 2016 Campaign? It is certainly an interesting match-up and combination of strengths and talents. On one hand, there is Clinton, who is a veteran politician and former First Lady of the United States (FLOTUS). Additionally, she has also served as a well-loved and respected senator from New York, as well as a former U.S. Secretary of State. Moreover, she has also had the benefit of vast prior experience with presidential bids–from her husband’s successful presidential bid and subsequent two-term presidency (1992-2000), as well as her own previous presidential bid in 2008, during which she was ultimately defeated by Sen. Barack Obama (D-Ill.) for the Democratic nomination. Subsequently, Obama went on to win the presidency twice and Clinton was appointed to his cabinet as Secretary of State. Her political pedigree and experience are undeniable. On the other hand, there is Warren, who is an inexperienced politician and has managed to become a hero of the Democratic party’s economic populists by railing against high student loan debt, as well as garnered attention on the platform of the political system being “rigged” by powerful lobbyists and the wealthy. This is also at a time when Clinton has received six-figure speaking fees on college campuses. In response, Clinton has stated that those speaking fees are passed along to her family’s foundation. However, she has stumbled and become flustered on recent inquiries into her family’s personal wealth. While Warren might not have the former FLOTUS’ political experience, she does possess an impassioned attitude and an outsider’s perspective, which could potentially work in her favor. It could also prove beneficial if Hillary Clinton and Elizabeth Warren were to join forces and create a potentially unstoppable dual ticket for a 2016 presidential bid. Both women possess unique perspectives and intriguing ideas, yet they have vastly different approaches and attitudes. It could be said that Clinton is a seasoned political or establishment insider, who has learned to accomplish her goals via working within the system. Whereas Warren is an ingenue political outsider, who could be considered a rabble-rouser and is ready to fight for what is right, as well as call attention to the fractured, corrupt political system and make inroads to correct it. Each woman has the ability to engage a crowd and attract a support base. However, they approach things from diametrically opposed viewpoints. Clinton is a poised, seasoned, and thoughtful speaker who considers her actions and remarks carefully. She is a consummate political chess player, who has learned from experience to consider the “big picture” and always plan three to five moves ahead. By contrast, Warren lacks political seasoning and tends to act from the gut. She speaks her mind and from the heart. She could be considered a pugilist among politicians. The freshman senator recognized a flawed system and has demanded action be taken to correct it. While Hillary Clinton remains the Democratic frontrunner for a 2016 presidential bid, freshman Senator Elizabeth Warren of Massachusetts is making significant waves within the political landscape, especially among liberals and progressives. The ingenue senator is bringing a bold and impressive vigor to significant and long neglected issues that require attention and resolution. She has also excited the populist debate in a fashion not seen in ages. Imagine if these two ladies were to ultimately join forces and combine platforms, what extraordinary goals could be achieved. This is, of course, dependent on whether or not Clinton opts to declare her candidacy again, and if Warren could be encouraged to join the presidential bid and create a dual ticket with the former FLOTUS. Could a Hillary Clinton and Elizabeth Warren dual ticket be the answer to the Democratic Party’s prayers and prove unstoppable for the 2016 Campaign? Only time will tell as the prospective candidates have many options to weigh and decisions to make for their own lives and families, as well as the good of the nation. 15 Responses to "Hillary Clinton Elizabeth Warren Dual Ticket Could Be Unstoppable for 2016"
Clinton-Warren 2016, Clinton-Warren 2016, Clinton-Warren 2016!!! Thanks for your contribution, Paul. The possibilities and potential are limitless if these two women were to combine forces/efforts. Clinton-Warren 2016 could be GOLD. We shall see! The world is shifting ever more so by even writing about the glorious possibility of this particularly strong two woman ticket. Thank you to both, in advance of the earthquake that could be CLINTON/WARREN. How could they not win? How many of us are there again? Are we holding on tight enough? Thank you for your contribution, Melissa. It is definitely time for a woman to lead the house–the White House!! 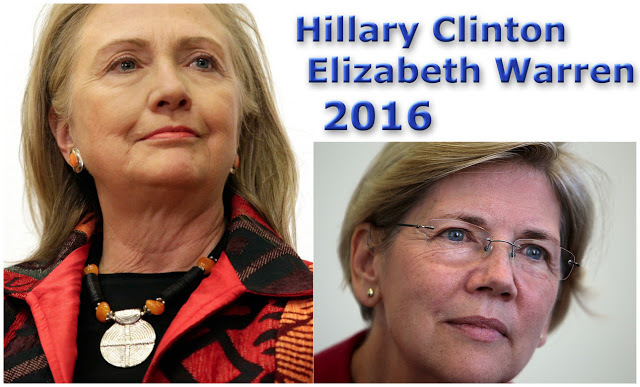 With Clinton-Warren 2016, we would have two powerhouse women to lead our nation…Unlimited possibilities! You can’t “overturn” Hobby Lobby. It’s not something you can legislate around. Sort of changing the makeup of the court this issue is DECIDED. They ruled on CONSTITUTIONAL grounds, meaning any further laws which attempted to force a closely held private corporation to cover the abortion pill would simply be bills of attainder. Yes, that is true. However, state legislation can be adopted to mitigate the effects of the Hobby Lobby decision. Many states, including New York, are already adopting bills to combat the decision. Thank you for your contribution. A Clinton/Warren ticket would be a nightmare for the GOP. I completely echo your sentiments, Czerny. Particularly regarding the limited and toxic GOP female candidate field.There is also the Republican tendency to “talk down to” and mitigate the role of women in pretty much every facet of life, which is one reason they have all but precluded themselves from any legitimate shot at the White House. Contrarily, the Democrats continue to present strong presidential candidate options. Hillary, of course, leads the pack and the suggestion of a Clinton-Warren 2016 joint ticket has Republicans concerned. They already know how strong a candidate Hillary is on her own, but in league with Warren, it would be a nightmare for the GOP and could prove unstoppable for 2016. Thank you for your contribution! We need new blood as a leader, Hillary has old Democratic ideas which we see as outdated for a changing world that we live in, Warren will be better to combat today’s problem than Hillary. Warren maybe able to get Washington to work together for the American people and stop this in-fighting that has cripple this Nation. For last 25 years we have been in a political gridlock and its just get worse as time move on, today we have more turmoil look at us as the world is coming unraveled do to terrorism thugs, because of this we are in more danger then before WW 2, and it will cost millions of lives to stop them. This will test our freedom or be controlled by dictators! I agree that fresh ideas and compromise are needed in this nation. However, I am not certain Warren is capable of achieving these goals on her own at this juncture. She is inexperienced and impulsive. Warren needs an anchor…Someone who can counterbalance her pugilistic nature in order to achieve goals. Moreover, I see Clinton as having many fresh ideas and a bold spirit of compromise. She is very well-liked and respected by the populace as well as fellow politicians. That is why I contend the Clinton-Warren 2016 joint ticket could be a winning proposition. It could achieve balance and inspire compromise. Thank you for your contribution. I agree. Clinton is a neo-con in policy, both domestic and foreign. I pray she does not fool the population. She caters to the likes of Goldman-Sachs and Monsanto. She cares nothing for American or any international citizens for that matter. Hillary has more to gain from that partnership than Warren does. Warren would be better off remaining apart from Clinton and losing to her than winning with her. She has her own political branding firmly established and from where I sit, it doesn’t really seem to be all that compatible with Clintons. Patience grasshopper. You make some valid points. At this point, Clinton has yet to declare her candidacy for 2016, and Warren has stated she has no intentions of running for president in 2016. However, it is still early and anything can happen. One of the reasons this idea of a Clinton-Warren 2016 joint ticket has caught fire is that their individual differences could compliment each other and result in a stronger overall ticket. Each woman possesses strengths and appeal to segments in which the other does not. While Warren does not have the experience or desire to be president, she could fit the vice-presidency quite well. Moreover, it would also position her very well for a future presidential run if she desired. There is also the added “hook” of two women on a joint ticket seeking the highest, most prestigious office in the nation, which could be very attractive from a political and populace standpoint. We shall see. Thank you for your contribution! …..see, that is where our opinions diverge. I would argue that she stands as much chance of being harmed by a stint as Hillary’s VP as she does benefitting. Case in point, would you say that the very likable Joe Biden’s chances of becoming President have been aided or harmed by being President Obama’s VP? I think there is a decent argument that Smokin’ Joe is no better off politically after 8 years as VP than he would have been otherwise had he not been the VP of such a polarizing figure as BHO….and I would say that Hillary is almost as polarizing as him. Your points RE: Biden are taken. Honestly, I do not believe Joe Biden had much traction in terms of a presidential bid either way. His role of VP to Obama has neither helped him nor hurt him, or more realistically, the pros have been effectively cancelled out by the cons. However, I would content that Biden’s dejected positioning for a presidential bid has resulted as much from his own actions as any association with Obama. Furthermore, I disagree about Hillary’s polarization factor. She is far and away the most well-liked, recognized, and popular potential candidate among the field–certainly across the board among Democrats and has sizable leads over most of the potential Republican candidates as well.The various political pollings continue to support her standing. She does have her follibles, but she is THE candidate to beat if she declares her candidacy again. There is a very powerful movement in the U.S. to see our first woman president and many believe Hillary will & should achieve that goal. If any woman can win the White House, it is Hillary. Warren presents as a bit of an enigma. She could prove to be a dark horse, but I highly doubt she will declare a presidential bid for 2016. However, I could see her creating a joint ticket w/Hillary, assuming the role of VP, and building her brand and experience in order to make a future presidential run of her own down the road.